Fans of the entry-level Eliminator 125 and BN125 motorcycles are all about adventure. Learning how to ride is one of the greatest gifts you can experience, because there are no limits to your ride. You need a dependable set of saddlebags you can trust, and Viking Bags has just what you need. 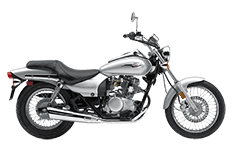 This collection was made specifically for the 125 series cruiser motorcycles from Kawasaki, so there's no second-guessing how well they will fit. Step inside and take a look at each bag to learn more information.